It’s been a while since I participated in an Absolute Write blog chain and I’m delighted to be back in the fold. This month’s prompt is Otherworldly: Ghouls, ghosts and things that go bump in the night. Here’s my contribution to the chain: a little piece of flash fiction entitled ‘Daughter of Man.’ After the story are links to the other entries in the blog chain. Please do click them to discover numerous Otherworlds. I’ll update the links as more writers join the chain. The people clustered a fair distance from my cottage as the priests intoned prayers and sprinkled holy water. I sat on the great rock on the headland, staring out across the vast gray Atlantic, smiling. Their pious exhortations would have no effect on me, for I am not the work of the devil. They scurried back to their village and locked their doors against the deepening dark and the glow of the rising full moon. They will not leave again this night, not even to aid those who will die. Many will die. Many. And I cannot bring myself to regret it. The clouds parted and the moon dressed me in its mournful light. I stood on the rock, raised my arms and inhaled a gasping breath. The sea surged towards me, bringing a distant ship to the horizon. I inhaled again, tasting the salty death once more, remembering the frantic struggle of my body against icy ocean and briny breath. The ship hauled closer and I heard the cries of terrified men. Two score years since the ravening mob screamed their curses and lifted me high. 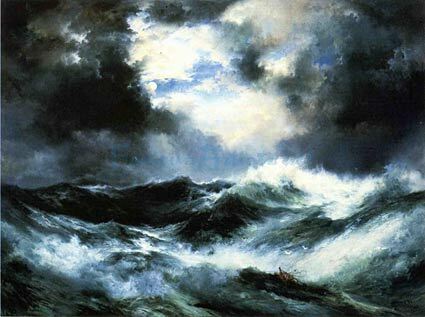 The worms in the provisions, the series of storms, and then the broken rudder – my fault, my blame. Women are unlucky on ships. Or so they said, as I pled my belly and begged for the life of my unborn child. Their hands on my ankles and wrists, their fists in my hair, they threw me from life, baptizing me in death, as my own true love averted his eyes and wept, cowering and silent. Once again I breathed the ocean, lifting the ship with my imploring arms and casting it down on the rocks below. I sat, listening to the splintering of wood, the crashing waves, and the silent, frantic struggling of dying men. I touched my hand to my womb, to the child who would never quicken and laughed into the sea spray of salt and death. The villagers huddled and cringed at my laughter, clutching their children close, begging their priests and their God to protect them from me. But I am not the work of the devil. I am the work of man. This entry was posted in Blog Tours, Hops and Chains, Horror and Dark Fantasy, The Writing Life and tagged Absolute Write, Blog chain, Diane Dooley, flash fiction, gothic horror. Bookmark the permalink. Very nice. I liked the unexpected ending. And Ye Shall Know The, By Their Works…. This is gorgeous, Diane! I love the imagery and the way you’re able reveal the depth of the character’s emotions with just that small, vivid slice of backstory. Very good, a lot of story in very few words. Wow, Diane. This is strong writing. The immediacy of your style and the sensory techniques put me in the scene. You have a strong command of connecting with the reader. I’m reminded of the myths of Scylla and Charybdis, both monsters for reasons not entirely their own fault and yet doomed to kill mercilessly because of it. Good job! Beautifully written and so perfectly dark for the occasion. Loved it. Great ending! Imagery was on the money, I really enjoyed reading it. Thanks for the kind comments, everyone! So much character is so little space. Well done. Well written and great visuals–encore! In one word, amazing! Your writing is so poetic. Besides the end line, this was my favorite: The clouds parted and the moon dressed me in its mournful light. Love this! And so beautifully written as well. You have such a lovely writing style. This short story is awesome! I would definitely love to read a whole book based on this and could devour it instantly. Great job! Love, love it! Ohhh boy, love this. Wonderfully written. “locked their doors against the deepening dark and the glow of the rising full moon.” Damn! I wish I wrote that! Beautiful piece. So visual. Loved it!